Gerry Adams, of Sinn Fein notoriety, once said, "I find it ever so much more difficult to make peace than to make war." He, of course, was not the only person to have ever uttered those words. It is often the case that we take the easy course, the shortcut, by strapping on the battle gear and going at it in our courts of law with litigation and trials to settle our disputes. In the process of this battle, we give up control. We let somebody else - a judge or a jury - decide, all the while abdicating the constructive and creative power that we might personally hold and exercise because we don't have the tools or confidence to go about the difficult work of peacemaking. Whether they are commercial or business disputes, or common family arguments or differences over catastrophic injuries from auto accidents or from medical treatment, understanding and hard work are required to settle them. As a mediator - and a former trial lawyer I have found that effective dispute resolution demands diligence, perseverance, experience and the fundamental comprehension that is the residue of all of these elements. Having given this admonition, here then are some secrets of mediation that I have observed during my years as a professional mediator and that work for successfully resolving disputes. Mediation, which is a process by which a neutral mediator works with the parties so they come to terms and resolve their dispute, offers the opportunity to do things we could never do in litigation or trial. We can talk with each other, instead of at each other. And we can take control of the outcome by negotiating certain aspects that a jury and a judge the determiners of fact and law in a jury trial - could never do for us with the same predictability. Awareness of the opportunities by itself, however, is not enough. We need the right attitude. Using the language of compromise and concession is important, as well as our best listening skills. Recognize that most, if not all disputes are conducive to mediation. We've seen too much TV, where, within an hour, all disputes originate, the litigants have their "day in court” with a trial and a jury reaches a verdict. Let's get real. Of all cases filed in the United States, a very small percentage ultimately go to trial. Empirical data and conventional wisdom tell us that there are only two or three very limited categories of disputes that should or must be tried. Yours is probably not one of them. Let's start viewing the mediation as our day in court. Don’t expect a totally rational process. Mediation is not rational in terms of the usual logic boxes of our business and litigation cultures. Remember, we are at the table to break out of those boxes to impact what likely may be a vicious cycle of contentiousness and dispute. Along the same lines, expect the unexpected. If you keep doing it your way, you might never break out of that cycle. Embrace the new ideas. In all probability, it can't hurt and it may help. Commit to it. You're presumably engaged in mediation to try something new. The old stuff certainly hasn't worked. 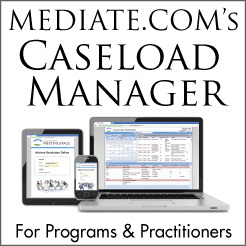 Don't litigate or mediate with the mediator. If he knows what he is doing, and he or she probably does, he can keep a secret and work with the information you give him positively, towards the ultimate goal of resolving the dispute. Lawyers and disputants alike know very little about what juries ultimately will do with disputes, yet we pretend all the time that we do know. Lawyers, after all, are paid by clients to evaluate and give opinions, not concede what they don't know. As a lawyer, I can speak from experience. Retain the flexibility in mediation to listen to other ideas and to allow ideas that are adverse to our own to sink in a little. He or she presumably comes with a set of skills you need. You and your lawyer have probably reached a dead end as warriors, and you now need some of the peace-making tools that the mediator carries in his or her box. Don't use the mediator merely as a neutral go-between. Listen carefully to the mediator. Be open to the mediator's optimistic messages. Make it your process. All this having been said, don't over-utilize the mediator either. The magic of getting it done is really within the power of the parties and disputants. It just seems like the mediator waves a magic wand at the end of the day, and things get miraculously done. It is the disputants who supply the magic powder for that wand. In short, there is no shortcut. That might explain why we are so ready to do battle, which, in some cases, will be the only way to settle. But for those parties who see the forest of advantages through the trees of challenges, mediation becomes a prime choice even though the parties started the war by filing a lawsuit. Jerome F. Weiss founded Mediation Inc (an Ohio corporation) which is devoted entirely to ADR activities. He has been mediating cases for 23 years. Jerry is a Distinguished Fellow in the International Academy of Mediators (IAM), the leading professional organization for active mediators worldwide. He was recognized as Best Lawyers’© 2013 Cleveland Mediation “Lawyer of the Year”.